Mobile device capabilities are growing at a rapid pace. When was the last time you were away from your phone for a whole day? A week? Even longer? The truth of the matter is, we are attached to our mobile devices. We use them for communication, online shopping, scheduling, and directions. When was the last time you used an atlas Map instead of a GPS? Our lives revolve around this tiny device. Many of us would be lost without out it (quite literally without GPS). Marketers need to be aware of this growing necessity of mobile devices. What better way to send messages than through their devices that they use daily? Studies show that collectively, Americans check their phone eight million times per day (Eadicicco, 2015) and individually an average of 2,617 times! (Nielsen, 2016). That is a significant amount of time to be using your mobile device—which is why it is so important to marketers! With growing technologies, marketers can use this increasingly popular platform to target specific audiences. 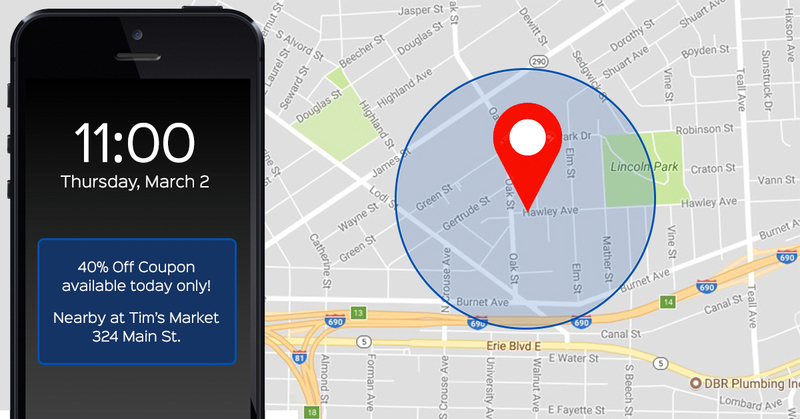 Geo-fencing uses hyper-local mobile targeting to pinpoint someone’s exact location. This targeting can be as simple as a city, or something more specific, like a particular address. For example, if you want to target a specific university to send individuals on campus a particular message, lat/long mobile targeting can send message(s) to those people with a targeted message. That being said-your smart phone is a lot smarter than you think! People share a lot of information through their mobile devices, which allows us to pinpoint their location. For instance, many people have their location setting turned on in their device, making it easier for when they want to use their GPS or Google search for restaurants in their immediate area. GPS is one way we can track people’s movements, but another is through cell tower triangulation, which means we are picking up their information through their cellular carrier. In addition to this, their mobile ID can track cookies on their device. These cookies collect data from their searches that can tell you about their interests, behaviors or where they go regularly. These ads can later be used to re-message these individuals who had previously visited that select area. As a business, why waste your time and money on sending your message to the wrong audiences? With this technique, marketers can send a unique message to a unique audience. As we are seeing with current marketing strategies, mass messages are no longer effective. In order to catch the attention of an audience, you need to make these messages stand out to these individuals—and no individual is the same—so no message should be the same! Finding a smaller, niche group of similar people is a more productive form. And maybe that niche market you are looking for is all right in the same spot.